The first story floors are boarded. Usually black lacquered or dark stained and varnished. An interesting feature are a couple of spy holes in the floor to see who is down stairs. One over outside the front door and one over the front room. The small trap doors to the spy holes were covered with a carpet to hide from visitors!!! I used contact glue to fix the boards. The ground floor was tiled with "large, rust coloured clay tiles layed in a diagonal pattern" in early houses. Fancy patterned glazed tiles were introduced later in the period. I am using air-dry clay from Art Friend to make 2inch square, 3mm thick pieces. The clay dries a bit too light, so they are stained with Behandla water based stain from Ikea and finished with Ronseal water based varnish. See, very green we are!! New use for cling film. Mould liner. Line the the moulds with the film, squash in the clay, place a second film over the clay and roll with the pin. Very clean!!! 500 grms of clay makes 30 tiles. The house needs 180 tiles. Each moulding, 3 tiles at a time takes 10 to 15 mins. Do the maths!!!! Got the floor tile manufacture down to 30/hr. Got better skilled at the job and introduced better method of working. More efficient too. Now getting 33 tiles per 500 grm pack. The clay shrinks approx 6% when dried. 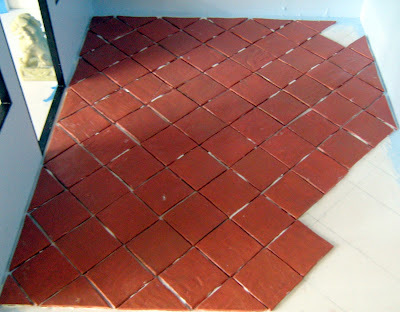 Before laying the tiles permanently, I drew a series of 45 deg lines across the bare floor. The tiles are not symmetrical enough to use spacers, as you would do on a full scale job. So had to rely on line of sight. I used grouting power from Diaso to fix as well as grout the tiles. I decided not to colour the grout as I am pretty sure they would not have had colouring available 60/70 years ago.